It’s true that I’ve had this blog for a very short time, but I’ve been journaling and blogging for years now. I’ve kept a *paper journal* for seventeen years and had a *LiveJournal* in high school and college, and then kept a public travel blog while I lived in Europe. It was a natural transition to this blog, or so I thought. In reality, it’s pretty challenging to write this blog. I don’t have the same sorts of natural followers and comments that I had on my other blogs, since those were largely friends and family keeping in touch. I’m also currently between classrooms, since I am a military spouse mid-move. This means that it’s hard to stay focused on educational issues sometimes. However, since this blog is still growing, I figured I’d share the vision with you of what I hope it will someday be. What made you start blogging? 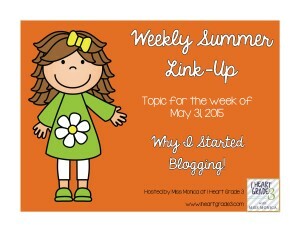 Check out the link-up at IHeartGrade3 for more articles from other fabulous bloggers! Thanks again for taking the time to link up this week! I appreciate you taking the time to participate! I have always kept a paper journal. I hadn’t made the connection but I guess that is a lot like blogging. I can totally understand the transition into an educational blog and the struggles of that. I have been at it a year now and there are a lot of ups and downs as I work through what and when to post. I think author interviews is a wonderful idea and I would love to see more of those posts!